Yes, this is one of the coolest bridges I have ever seen. Built by J.C. Booth Middle for the Science Olympiad Georgia State Finals in 2003, it placed 3rd. For those of you who don’t know Booth, keep reading. Booth Middle School has won the Georgia State Finals as a team for longer than I can remember, except for one year. They always have an excellent team, and provide much frustration and motivation for the rest of us. When I first signed up for Bridge Building, I heard that Booth was the team to beat. So I made up my mind that I would beat them. Well, as a 6th grader and a newbie to Science Olympiad I didn’t know what I was saying. However, I found out that Booth wasn’t the one to beat for Bridge Building. Rising Starr won that year with a 11.something gram bridge, holding 33 pounds. Chamblee won the next year, and E.T. Booth (not the Booth previously referred to) won in 2002. Booth, however, did win in 2003. This is not Booth’s winning bridge, just a cool one. Then all my hopes came true, when I beat everyone in 2004. I actually have a picture of Booth’s bridge for 2005 (this year), and it is a nice one. But it didn’t win. Still, I might put it up, as the bridge rules have changed enough so nobody can use that design. How much pounds did it holded? 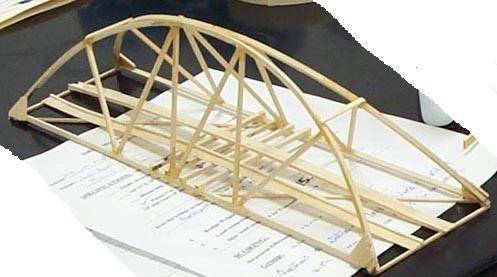 could you please do a tutorial on this bridge please? awesome design. 35 queries in 0.987 seconds.